← Idiot Greenpeace Media Officer Thinks 40 years Equates To A "Casual Flirtation"
Given that the EPA is shutting down coal plants across the country, I thought I’d go over some implications, and review some things which may not be obvious to everyone. The coal plants being shut down provide slightly less than 2% of our baseload capacity. Baseload is the known amount of electricity which will be used at base demand. That is to say under “normal” conditions. So, what happens, is the operators of coal plants and nuke plants set their output and just let it go. Now, during any given time, the demand may increase beyond the baseload, so the baseload must be supplemented. We call this peak demand. Natural gas is great for the function. The reason is, the output is much quicker to respond to the necessary adjustments. A good analogy would be the difference between a gas grill and a charcoal grill. Sadly, very soon, we’ll have less baseload capacity. This, in part, will be made up with additional power plants. I’ve no doubt the loons wish and believe much of the coal energy will be supplanted by alternative green energy. But, it can’t be. Coal is baseload. The “clean” energy isn’t reliable enough to be base load. We’re not adding any nuclear to speak of. And, neither are we adding any hydro. So, and difference made up will be made up with gas fired generation. But, what’s the big deal? We’re finding more and more natural gas on a daily basis, and we’re getting it! We are the world’s largest producer of natural gas and we’ll likely extend the lead in the coming years! But, here’s the problem. We’ve other uses for natural gas. 97% of the coal we get is used for electric generation. It is also used a bit for steel manufacturing. But natural gas? Natural gas has many other uses; cooking, heating, industrial, transportation all of which natural gas plays a huge role. But, again what’s the big deal? We’ve such an abundance of natural gas why not use it? As you can see, in spite of dramatic increasing production, it has only been in the last couple of years which production has exceeded demand. 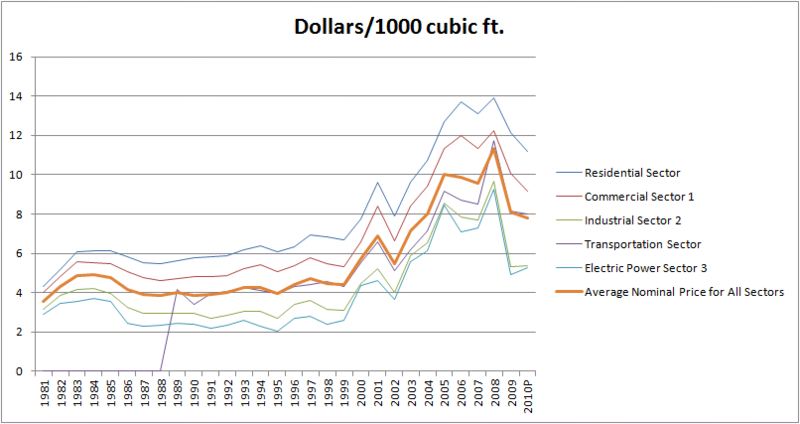 And, we’re seeing a leveling off of the price decrease, even though it is still more costly than what it was in 2003. Much of the recent cost decrease was due to the recession. Again, once the recession ends, the price of natural gas will take off again. And the price increase will effect a much larger portion of our economy and society. Already heating costs are too much. We need our natural gas. And we’re going to increase our need for it. There’s no point to needlessly add to the demand in using for base load generation if we don’t have to. And, we don’t. This entry was posted in Economics, Energy. Bookmark the permalink. I didn’t know we still had steel mills?? I also read that we are on schedule to become an oil exporting nation again….that has to be crude. lol, I don’t either, but I always thought you were a marine bio or some such. And yw.. 😉 I just don’t get otherwise intelligent people who refuse to think critically. Something like that…..I thought I was until we started taking on these green new hires that know it all……..
We call them “coats”, because they are right out of school, think they know it all, are brain washed in school….and think they are going to run around in their crisp little white lab coats and save the world. Fortunately, I don’t run into too many. We do have a few that come by to complain about our energy mix…… and during conventions, I run into some despicable people that use this alarmism and smart grid requirements to raise the margins of their companies. But, there isn’t much to be done about it, they’re just going with the flow and profiting as they do. These greens are some very, very stupid people. And, no, they just don’t get it……. or, their goal isn’t really a reduction in atmospheric CO2. There’s just nothing quite like Carpenter Stainless Steel – I have a machine shop and we love the stuff. I don’t think their goal is a reduction in atmospheric CO2. It’s a mindless attack on industrialization. It’s a hatred of capitalism, prosperity, consumerism, and man made anything. It’s an inexplicable desire for the destruction of the fabric of society. It’s a cult of self destruction. Jonestown, Heaven’s Gate. Yes, some form of misanthropy and self-loathing. I’m not sure how to stop it within the confines of what our political system can do. We would first need a Prez who even understands the threat. I don’t think any candidate on the right understands this. But it’s gaining traction within the party. Blogs like this one, linked thru Climate Depot, have helped to educate them. Yeh, Climate Depot has really helped. And you’re right, we don’t have a candidate that understands any of this. They way to stop it is to have a great communicator articulate this insanity. I don’t think we’ll ever be rid of those people. And, maybe its time for a 3rd party, but the 3rd party would only split the conservatives. It would be a lot easier if the unions weren’t a bunch of communists. Real workers would flock to anyone that would stand up to these loons. A good book on this topic is “Power Hungry – The Myths of “Green” Energy and the Real Fuels of the Future” by Robert Bryce. I don’t agree with everything in the book, it’s one of those chock-full-of-facts books and when you go back and fact check you find a lot has either changed since it was written or the facts don’t quite line up…in any case, his conjecture is that we should move energy production to nuclear and natural gas. He isn’t too fond of mountain top removal coal mining and from personal experience in mines I hate underground coal mining. So. What to do? IMHO step one is don’t mess with what we have in place if it works. We all just assume that when we switch on the lights, they will just magically go on. That certainly is not the case in many countries and we need to be ever grateful for our existing energy infrastructure. I remember the Enron rolling blackouts in California when I still did business there and there should have been rioting in the streets! Step two IMHO is that if we want to move away from coal, it should be very gradual and it should be market driven. There is a good thread over at WUWT on corn ethanol subsidies and I have asked on two posts why we should use public money to fund ethanol if it is such a great idea. However, we have the opposite of public support when it comes to nuclear – our policy is to squash it. I’ll try to abbreviate…… Gas, coal, nuclear, and corn. All are great treasures and resources of the U.S. and the world. It is insanity to try and use one as another. They should be used for what they are. In other words, we shouldn’t move away from coal. We should encourage nuclear, where it is reasonably safe. And we should use natural gas as it was designed. Corn is for people and animals to eat. Nothing more, nothing less. At WUWT, I did everything but spell it for them. ….. happens. I used to get knotted on the head for playing with my food. I think many others should be knotted on their heads for playing with our food. I believe the Nat Gas price is now around $2.50, not $6. And it may fall further. Some drilling companies are working to make sure they stay profitable down to about the $1 level, if possible. So the economic analysis here is bunkum. Thanks Brian….. as the graphic indicates, there are different prices for different sectors, so it’s pertinent to state what sector it is. And, while the data is a couple of years old, it doesn’t mean it’s bunkum. As you can see, in the 90’s we had ranges of gas prices from $2-$6 range…..
Further, the whole point of the post is that we should use our resources for what they’re best fitted. If we’re going to use nat gas for electricity, then expect to see the domestic cost to stay elevated. Look back up at the graphic and check that with your bunkum claim. WTF good is it to increase demand to coincide with the supply at the expense of another resource in abundant supply? That’s vapid. I’m assuming you’ve wandered here in the response to the comment I made at WUWT. My point of the comment was that in 2009 the prices hadn’t dropped enough to cause a market migration to nat gas from coal. Nat gas use increased as a direct response to the implementation of soft renewables, because you have to back them up with natural gas, regardless of the pricing of coal vs. nat gas. I’d have to look into it, but I really doubt nat gas can be profitable at $1/ 1000 cu ft. Especially for the wells where one has to continually pump the water off of. Thanks for dropping by, stick around, there’s plenty else to comment on…..